Divers working in Lake Chebarkul have recovered a half-ton chunk of the space rock which exploded over Chelyabinsk earlier this year. Space isn't as empty as the name might imply. The Earth is constantly being bombarded by tiny chunks of rock so small that they last mere seconds in the upper atmosphere. More often than not, these meteors are harmless and simply burn up before getting close to the planet's surface. 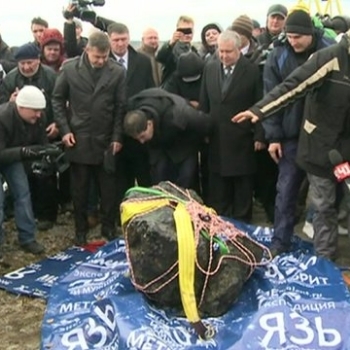 Back in February, however, Russia had an unexpected visitor from outer space. A 17m long meteorite burned a bright trail into our atmosphere and exploded above the city of Chelyabinsk, putting 1,000 residents in hospital from broken glass and rocking buildings. Now, divers have salvaged a chunk of the meteorite from the bottom of a nearby lake and it could rank in the top ten biggest fragments ever found. The original meteorite, estimated to be a mass of 10,000 tons, splintered into multiple fragments after the explosion. Many fragments were recovered soon after its destruction, but a 6m wide hole in the surface ice of a nearby lake caught the interest of scientists. Not only because the timing of the holes discovery hinted to the possibility of finding a chunk of space rock underwater, but primarily because of its cushioned landing in the water, there were high hopes for a rock of considerable size. A 1.5m long fragment has now been successfully recovered from the bottom of the lake and scientists immediately tried to weigh it. However, the rock broke into three pieces when being attached to the scales and upon eventually being secured, the scales broke the moment it hit 570kg. This is not the first chunk to be recovered from the lake, but it is the biggest so far. Past attempts to find meteorite fragments under the lake have resulted in the mistaken salvage of normal Earth rocks. However, scientists are confident this discovery is no fake. Meteorites show tell-tale signs of having survived Earth's atmosphere known as a fusion crust and regmaglypts. "A fusion crust forms as the meteoroid is travelling through the atmosphere as a fireball." Explains Dr. Caroline Smith of London's Natural History Museum. "The outer surface gets so hot it melts the rock to form a dark, glassy surface crust which we term a fusion crust. Regmaglypts are the indentations that look a bit like thumbprints, also seen on the surface of the meteorite." Prof. Sergey Zamozdra of Chelyabinsk State University claims: "This chunk is most probably one of the top 10 biggest meteorite fragments ever found." The largest meteorite fragment on Earth is the Hoba meteorite, weighing in at 60 tons. Though this fragment is much smaller, it has clearly generated a new buzz surrounding the study of extra-terrestrial objects that have made their way to Earth.